Biography Arnold William Brunner (September 25, 1857 – February 14, 1925) was an American architect who was born and died in New York City. Brunner was educated in New York and in Manchester, England. He attended Massachusetts Institute of Technology, where he studied under William R. Ware. Early in his career, he worked in the architectural office of George B. Post. He was a Fellow of the American Institute of Architects after 1892 and was appointed by Theodore Roosevelt to the National Commission on Fine Arts in Washington D.C. He was a member of the New York Fine Arts Commission, the American Civic Association, The Century Association, The Engineer's Club, The Players, the Cosmos Club in Washington D.C., the National Institute of Arts and Letters, The Union Club of Cleveland, and several other organizations. Brunner was also known as a city planner, and made significant contributions to the city plans of Cleveland, Ohio, Rochester, New York, Baltimore, Maryland, Denver, Colorado, Trenton, New Jersey, and Albany, New York. Brunner was, for a short time, partnered with Thomas Tryon as the firm Brunner & Tryon. 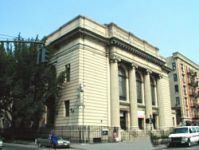 Brunner designed several notable buildings including, with Tryon, the 1897 Congregation Shearith Israel, on Central Park West, New York, to house the United States' oldest Jewish congregation, founded in 1654. No attempt was made to convey an "eastern" vocabulary, as was often being done for other Jewish congregations: Brunner and Tryon provided a forthright Roman Baroque temple with a projecting three-bay center that contrasts with the windowless ashlar masonry flanking it and contains a recessed loggia entrance under three large arch-headed windows, articulated by a colossal order of Corinthian columns surmounted by a pediment over a paneled attic frieze. 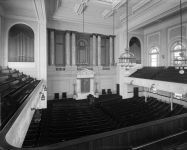 Another synagogue designed by Brunner was Temple Israel at 201 Lenox Avenue, at 120th Street, in 1907. The limestone building was not designed in the typical Moorish Revival style of other synagogues of the time; Brunner argued that "synagogues have no traditional lines of architectural expression". 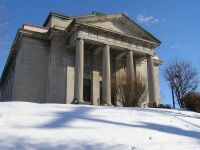 According to David W. Dunlap, the building "looks like a Roman temple until you notice the Stars of David in the column capitals, fanlights, and spandrel panels", and "may rank as the single best Neoclassical synagogue in Manhattan". Brunner also designed improvements at the Pennsylvania State Capitol in Harrisburg, the Stadium of the College of the City of New York - also known as Lewisohn Stadium, Mount Sinai Hospital in New York City, and the U.S. Post Office, Custom House and Courthouse (1910, illustrated) in the Group Plan conceived by Daniel Burnham, John Carrère, and Brunner in 1903 to create a new urbanistic center for Cleveland, Ohio, which was a rare realisation of a "City Beautiful" plan. Other work in Ohio included the Monumental Bridge in Toledo and Denison University in Granville, Ohio. 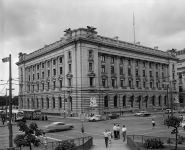 He also won the competition for the design of the U.S. State Department Building in Washington D.C.
Students' Hall at Barnard College was built in 1916 and listed on the National Register of Historic Places in 2003. Brunner designed a bascule bridge over the Maumee River in Toledo, Ohio, that remains in use today, as the Martin Luther King Bridge. Brunner's design introduced an innovative design for keeping streetcar power lines taut, yet allowing them to be safely raised with the bridge deck. Other lift bridges copied this innovation. Through a bequest from Emma Beatrice Brunner, widow of Arnold W. Brunner (1857-1925), the Academy, since 1955, has given an annual prize, now $20,000, to an architect of any nationality who has made a contribution to architecture as an art. Mount Sinai Hospital, founded in 1852, is one of the oldest and largest teaching hospitals in the United States. In 2011-2012, Mount Sinai Hospital was ranked as one of America's best hospitals by U.S. News & World Report in 12 specialties, and in 2013 Expertscape recognized it as having the world's highest level of expertise in three programs. Located on the eastern border of Central Park, at 100th Street and Fifth Avenue, in the New York City borough of Manhattan, Mount Sinai has a number of hospital affiliates in the New York metropolitan area, and an additional campus, the Mount Sinai Hospital of Queens. The hospital was first located on 28th Street in Manhattan, between 7th & 8th Avenues. In 1872, the Hospital moved uptown to the east side of Lexington Avenue, between 66th and 67th Streets. In 1904 a $1.35 million expansion of the 1904 hospital site raced to keep pace with demand. The opening of the new buildings was delayed by the advent of World War I.